I sat down to write a blog post and then I heard my two-year-old say, in a voice filled with awe, "That's a lot of fish food." And he was right, seeing as he'd dumped the entire container into the fishbowl with Fuego, our new betta fish (who replaced Bluey the miraculous zombie fish when he finally met his demise). So I had to stop writing before I ever got started. Now I'm back at the computer, obviously, but with a few things working against me. It's going to be one of those days when I can't leave my children unattended for long enough to hammer out a decent post. Also: the smell of pee is emanating from my kitchen trash because my husband tends to throw diapers there instead of in the garage trash, which is where they're supposed to go. Barf. And since I'm sitting by the kitchen trash, well, you know. First off: I've got a new giveaway up! Just click on the "Giveaways and Reviews" tab up top and you're on your way to winning a £50 voucher from Simply Swim! Woohoooo!!! Secondly, I forgot to tell y'all this. A few weeks ago I get a call from a random 800 number that I didn't answer because hello, 800 numbers only mean telemarketers or bill collectors. So when they left a voicemail, I was surprised to hear, "Hi, this message is for Colin Templeton. Mr. Templeton, you had requested information online about a bachelor's degree in game design from Full Sail University, and I was just calling to set you up with an admissions counselor." Colin Templeton is my seven year old. My seven year old who is going through a phase where he is obsessed with video games and how they are made. Apparently he decided to request information about a bachelor's degree. He probably doesn't even know what that is, exactly, but hey, "game design." And third, our little Corbin Daniel - or as I call him, Lieutenant Dan (a la Forrest Gump) - started smiling yesterday. Couldn't you just eat little smiling babies up?!? Squeeeee!! 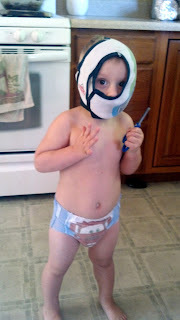 Now that he's finished terrorizing the fish, he's moved on (inexplicably) to an underwear mask and a pair of scissors. They're the child-safe kind, of course, but the bigger question is: is anything safe from the child? This just made my day. Between te baby smile and your son who inquired about a bachelor's degree, you made my morning. I love those baby cheeks! And the underwear mask is very attractive if I do say so myself. Hey, maybe he'll be the next Doogie Howser of the gaming world. Love the underwear mask! Let's just hope he doesn't think of it again at Halloween! And who would be surprised if Colin took college classes? If he's interested in something he will study it in detail for as long as it takes to learn it. I think he could do it! 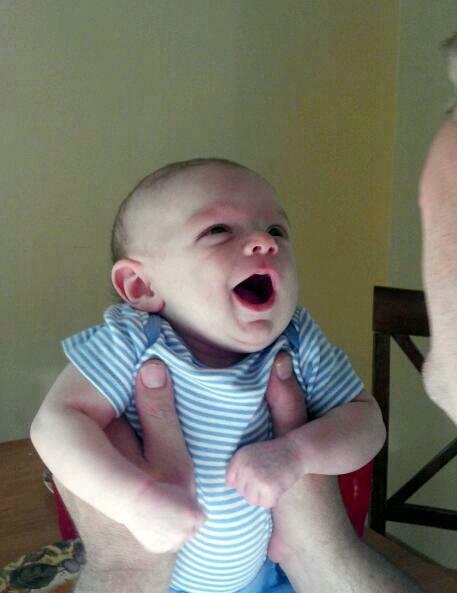 And I LOVE Corbin's big smile! I put that pic on my desktop at work today and smiled every time I looked at it - and so did lots of other people. Ahhh! A toddler feeding fish. I recall a certain cousin of Coby's feeding my fish for me while I was at work. I have a picture of Ben next to my fish bowl with his hand on the food. I love Corbin's big smile but he needs to stop growing up so fast. Colin and a bachelor's degree in gaming design, I can see him taking the classes and doing better than some of the adults in it. Does this college know that they are dealing with a 7 year old but is actually smart enough to be in college. Coby is so cute with his underwear mask. Is he some sort of super hero? baby's like that are so yummy!!!! !